Envirostik > Visit Us At FSB 2017! Tenemos que instalar un campo de rugby y queremos alcanzar los parámetros de prueba del IRB, ¿cómo lo logramos? ¿Se puede instalar césped artificial en mojado? Whether you are a long time customer of ours or are new to our product range we would very much like to see you at FSB, The International Trade Fair for Amenity Areas, Sports, and Pool Facilities, at Cologne 2017. We will be displaying our range of artificial grass adhesives, tapes and other products in Hall 10.2, Stand A28/B29 and would be pleased to advise you on their qualities and applications. 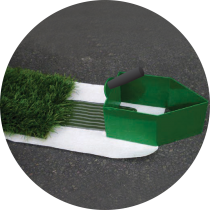 The Envirostik range of adhesives, tapes and other products are designed to ensure a quality finish and the long product life of any artificial grass installation. We have products for small decorative landscaping jobs right up to the largest high-performance sport surfaces. Come and see us on stand A28/B29 to see why we’re the market leader!